If you’ve ever wondered how to manually approve new user registrations on your WordPress site or have been looking for a plugin that allows you to do this then Ultimate Member may be the plugin for you. With Ultimate Member you can set up your site so that when a user registers they must be manually approved before they can login. Below I will show you how you can do this. The first option you will see is registration status which you need to change to “Require Admin Review”. Once you do this the options below will change and you will see that the default action taken after registration changes to “Show Custom Message”. You can either keep this action as it is (you can customize the message text below) or you can decide to redirect the user to a custom url. Once you have set the registration status and decided upon the action you can then save the changes and now anyone registering on your site will have to be reviewed by an admin before they can be approved. When creating a site where an admin needs to approve registration it is normal for there to be certain criteria a user must meet for them to be approved (e.g must be male or female or above a certain age). So the next step is to add fields to your registration form that will enable you to collect the required information that will allow you to make a decision on whether to approve a member or not. 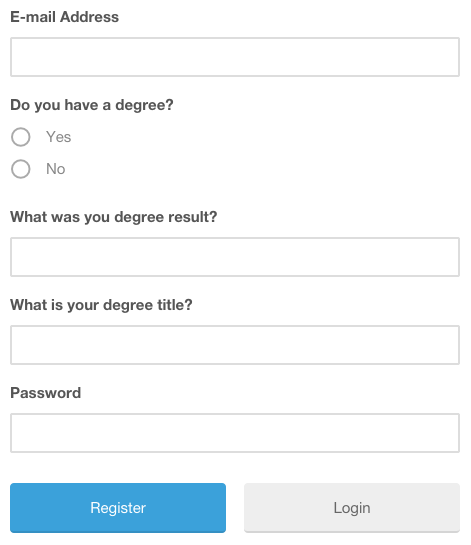 For example if creating a job site for graduates you could add fields to your register form asking sign ups if they have a degree, what degree result they got and the title of their degree. The user then completes the registration form and clicks the register button. Once the user submits the form, the register form will disappear and they will be shown the custom message set on the user role page. As soon as a member completes the registration form the user will show up on the users overview widget on the UM dashboard page which gives an overview of your site’s users. If you click on the pending review link you will be taken to the users page where it will show a list of all the users requiring admin review. To review a member you need to hover the mouse over the user and click on the info link which will open up a modal containing that user’s submitted information. Once you have reviewed the information you then need to either approve or reject the member. To do this all you need to do is select the checkbox next to the user, choose approve membership or reject membership from the take action dropdown and click apply. Depending on what action you take the user will either become a fully approved member or will be moved to the rejected list. When manually approving new users on your site it is important to keep users updated on the process and alert the admin to new pending users. Because of this Ultimate Member provides several customizable email templates which are automatically sent depending on user actions. For the user they will receive an email letting them know that their application for membership is being reviewed and will also receive an approved or rejected email depending on whether the admin has approved their application or not. The site admin also receives an email each time a new user registers which will allow the admin to quickly review the member and approve/reject their membership.